Just after sunset, the planets Saturn and Mars are visible above the horizon in the west‐southwest sky. Saturn is the brightest object in that part of the sky, while Mars is a visibly fainter red dot to the left of Saturn. 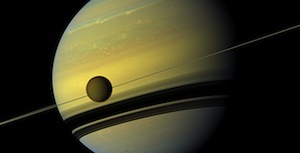 (The photo to the right is Saturn and its largest moon Titan, as seen by NASA’s Cassini space probe. The thin white line behind Titan is Saturn’s ring system, in this case seen edge‐on. The black bands across the lower half of Saturn are the rings’ shadows.) Near the end of September, Mercury also will make an appearance in the early evening sky — Mercury will be just above the western horizon immediately after sunset. Around midnight local time, Jupiter begins it’s climb up from the eastern horizon and appears as the third brightest object in the September night sky (after the Moon and Venus). Then about 3:00 AM local time, Venus rises in the east. As sunrise approaches, Jupiter and Venus make a dramatic pair of bright objects in the east and southeastern sky. As you may remember from last month’s Stargazing article, Neptune just reached opposition on August 24 and was at its most visible for 2012. Now it’s Uranus’ turn. The distant gas giant Uranus will be at it’s most visible during September and will reach its opposition September 29.1 With binoculars or a small telescope, it is very easy to see the planet and you should be able to detect Uranus’ distinct blue‐green color.2 Meanwhile, Neptune still remains visible with binoculars or a telescope. For help finding both Uranus and Neptune in the September sky, the Sky & Telescope website has a downloadable/printable star map shows exactly where to point your telescope or binoculars. Last month, I told you about how NASA’s newest Mars rover — Curiosity — was on target to land on the red planet in the early hours of Monday, August 6, 2012. Although at that time a successful landing was anything but certain, everything went as perfectly as possible. The Curiosity rover touched down gently on the Martian surface, in Gale Crater and within driving distance of Mt. Sharp (an eventual destination for Curiosity). 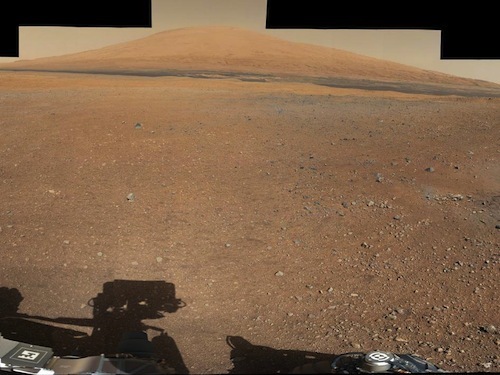 Since its arrival on Mars, Curiosity has been busy taking pictures and doing lots of science. On August 25, Curiosity used its onboard laser to vaporize a rock on the Martian surface in order to analyze the rock’s composition. Curiosity also has been taking short test drives and becoming familiar with its surroundings. After less than a month on Mars, Curiosity has (figuratively and literally) only begun to scratch the surface, sending home massive amounts of data that will keep planetary scientists busy for years. 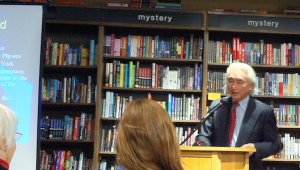 Now the fun begins, with discoveries that will expand (and possibly rewrite) everything we previously knew about Mars. A number of public Curiosity Landing parties took place around the country, including one (which I attended) at Chicago’s Adler Planetarium. The Alder’s event kicked off at 9:00 PM on Sunday, August 5, or about 3.5 hours before Curiosity’s scheduled landing. The prevailing wisdom is that most typical Americans no longer have interest in space exploration, unlike the public excitement during the Apollo era when men were walking on the moon. Combine that with the fact that Curiosity was landing in the middle of the night, just hours before the start of a work week, and the expectation for attendance at a party like the Adler’s was low. The Adler planned to show the NASA‐TV feed from JPL in two of its theaters, but it quickly became apparent that interest was far beyond what was expected. 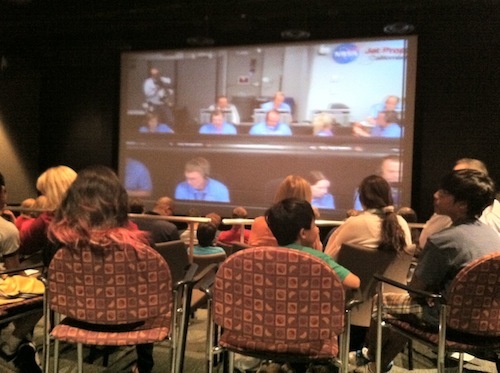 Over 500 people came to the Adler to watch Curiosity land on the red planet, including many families with children. Curiosity isn’t NASA’s only hardworking spacecraft. The Dawn spacecraft has just completed a year studying the dwarf planet Vesta3 and on September 4, 2012 Dawn will fire its engine and depart for Ceres, a second dwarf planet in the asteroid belt. Dawn uses a revolutionary ion engine4 that accelerates and decelerates extremely slowly, meaning it will take Dawn 2.5 years to travel to Ceres. When Dawn arrives at Ceres in early 2015, it will become the first space probe ever to have orbited two separate worlds.5 Previously, space probes all were designed either to visit just one world (and remain their until they stopped operating), or to fly by multiple worlds without actually stopping at any one of them. While Dawn resumes its journey in September, the two Voyager spacecraft are continuing flights that began 35 years ago. Voyager 1, which launched September 5, 1977, is 11 billion miles (18 billion kilometers) from the Sun. Voyager 2, which launched August 20, 1977, is close behind, at 9.3 billion miles (15 billion km) from the Sun. After all that time and travel, the Voyager space probes are now leaving our solar system and entering interstellar space. What exactly does that mean? The two are departing the neighborhood of our Sun and literally beginning to travel through the space between the stars. NASA has dozens of other spacecraft hard at work around our solar system. For information on all of the current active mission (including a number studying Earth itself), visit the Current Missions page of the NASA website. What lies ahead for this stargazer . 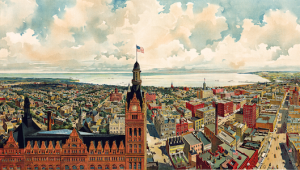 . .
On Tuesday, September 4, 2012, I’m beginning studies in the Astronomy program at the University of Wisconsin–Madison with the goal of eventually earning a PhD in Astronomy.6 (The building in the center of the photo at the right is Sterling Hall. 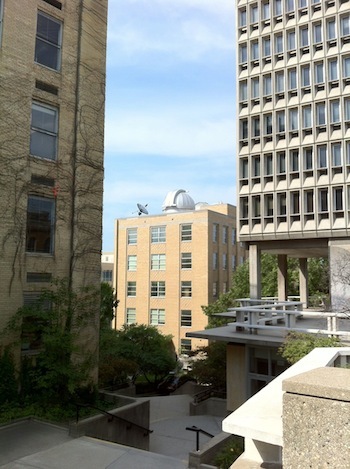 The observatory domes on the roof are one clue that Sterling Hall is home to UW–Madison’s Astronomy Department.) 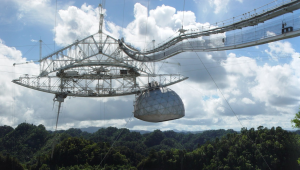 I’m looking forward to formalizing my passion for astronomy and space exploration, and hope to to share as much of that as I can through these Stargazing articles. Stay tuned!